This article appeared in the SGIA Journal Fall Garment Edition 2018 Issue and is reprinted with permission. Copyright 2018 Specialty Graphic Imaging Association (www.sgia.org). All Rights Reserved. The SGIA Journal sat down with Ford Bowers, President & CEO, SGIA, to hear more about what's driving this change and what's at stake. 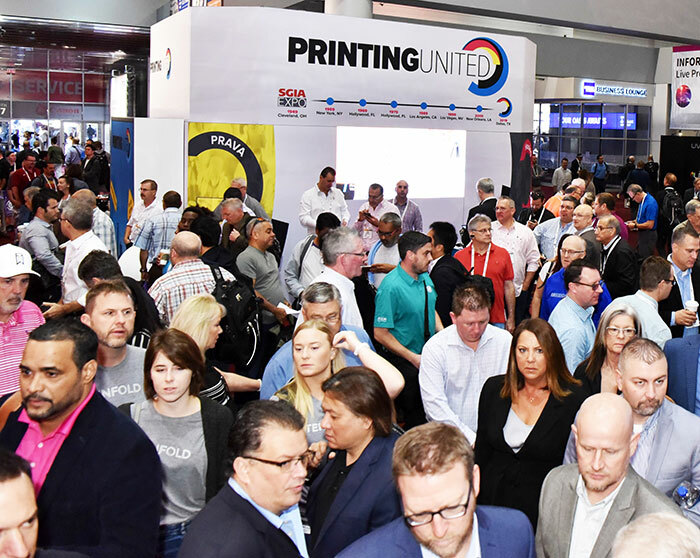 SGIA Journal: What is the principal difference between the SGIA Expo that just closed and what PRINTING United will bring to life next year? Bowers: The simplest description is that PRINTING United will have a significantly broader range of vendors on the floor, representing a much fuller range of capabilities, including segments we have not traditionally represented: commercial, in-plant and packaging. We will also have an audience that represents those segments in addition to our historical communities of graphics, garment and industrial printing/printed electronics. The SGIA Expo is arguably the most exciting and successful show in printing and has been for some years. Why did you feel the need to change it up? The market doesn't allow the option of not changing. PRINTING United is a reflection of what is taking place in the printing industry. It is our response to those changes and an attempt to navigate them as best we can. Change is taking place for printers and original equipment manufacturers (OEMs) (suppliers). Digital printing technologies - especially inkjet - are creating a lot of opportunities for crossing what traditionally have been boundaries based on printing methodology. For example, offset printers rarely decided to get into industrial printing or garment decoration, as these were primarily screen printed products. But now, once a printer has installed digital workflows, it is easier to buy another piece of equipment suited to another product line, which opens up other vertical markets to potentially sell into. It's not always a slam-dunk, but it is happening with dizzying speed. If you look at the research we conducted with NAPCO Media ("Convergence in the Print Industry: Understanding Growth Opportunities and Competition," available on printingunited.com), you can see the extent to which this is happening. So, for printers, being able to attend one event and see all the potential adjacencies they can take advantage of is more efficient than going to several shows throughout the year. For the manufacturers, much has been learned about digital inkjet over the past decade. The speeds and qualities are such that, rather than just being a replacement for screen print - an inherently slow and low-resolution method when compared to others - the newer inkjet applications are now in a position to replace analog processes, such as offset and flexo - at least in the short-to-mid-run. And, there are a number of advantages regarding variable data, regionalization and inventory management that are attractive to end users. The problem, then, for OEMs is that they now have to sell into multiple printing segments, which requires them to go to more and more shows to address multiple audiences. Trade shows are almost always the single highest spend for manufacturers. Reducing this expenditure is a goal almost universally held. PRINTING United will address this issue like no other show in North America. So, what would be the result of not pursuing this coming together of segments and exhibitors? Well, the first effect would be the financial struggles SGIA would ultimately face as a result of not doing this. Our business model as an association is based principally on the revenue that comes from the trade show. This allows us to keep our dues at a very modest level. For the past few years, OEMs have been funneling much of their research and development (R&D) budgets into digital equipment in the commercial and packaging segments. Where their R&D dollars go, the marketing spend soon follows. They would eventually cut back their spending at our show, chiefly in the wide-format graphics segment, and we would have less revenue coming in. Less revenue means less staff and services and a decline in our viability as an association. It may take some years, but the decline would be inevitable. This is not a future I, or the Board of Directors, wants for SGIA. Furthermore, if we didn't do it, I'm convinced someone else would. The market demands this and what the market demands, the market eventually gets. If someone other than SGIA is able to bring all of these audiences together to drive the full range of exhibitors, then our decline would come much faster. So, you're saying we are as affected by the exigencies of market forces as any business would be. Absolutely, we are not exempt from the effects of competition, regardless of our nonprofit status. Is this a unique set of circumstances? Have we ever been here before? Yes and no, I believe. If you go back about 20 years, SGIA began to embrace digital printing technologies and encouraging vendors to bring that equipment to the Expo. There was a lot of internal debate about how this was a move away from the core mission as a screen printing association. If we had not done so, we would be a much, much smaller organization today as that expansion of the Expo allowed us to continue to service the screen printing community. So, to some extent, it was a decision with existential consequences. It definitely changed who we were, but also ensured our survival. In fact, it helped us survive, even thrive, for another 20 years. Now, we face another moment where what we do may feel like we are moving even further away from our roots. We will continue to adapt and change to meet the challenges of an unforgiving market. Not changing would be the biggest strategic error - ask anyone you know if the business plan they have today is the same as it was five years ago. And one final note on this: How many screen printers - the printers we were formed to serve - have not yet adopted digital printing technology? The answer is less than 1%. Those that have are exploring even more options to expand their product lines and markets served. More and more printers are no longer defined by a specific technology. Does it make sense that their association would be? The world of print is complex; we should strive to be comfortable with complexity. Describe the partnership with NAPCO Media and how it is part of the strategy. NAPCO Media are kindred spirits in that they see the market changing in the same way we see it. They clearly see the opportunity to significantly improve the efficiency of the trade show market for suppliers in a way that benefits printers as well. What they bring to the table is their reach into the segments SGIA has not historically played in, namely, commercial, in-plant and packaging. Their publications - both in print and electronic - are arguably the most influential and widely read in their arena. They also have deep relationships with the vendors in those areas and are respected for their market savvy. Between the two organizations, most of the major printing segments are represented on both the print service provider and supplier sides. How are these changes affecting SGIA as an association? Of course, if we are successful, we will have more resources to expand our work in a number of different areas. We have launched new events, but also have greatly expanded our research efforts. Next up is an expanded government affairs program. We have workforce development and training in our sights, as well as other programs that can be expanded. As I previously mentioned, however, the market is very complex. We face a paradox of sorts in that while printers are crossing boundaries, and everyone is participating in one large market with several potential applications to explore, everyone still wants to be part of a community in which they can see themselves and identify with similar printers. Therefore, the challenge for us is to build community within each segment, where printers can feel a sense of belonging and engagement, while providing them the opportunities to move between those segments when required. While everyone is in one sense a printer, the personas, goals, language and business models can vary widely from one community to another. Messaging to each is different, to say the least, and they have different priorities in terms of what they believe an association should provide. Dealing with this complexity will occupy us for some years to come. Does this mean that the membership has changed in terms of the primary community? It has. Two years ago, we did not even offer the option to select commercial, packaging or in-plant as a primary printing community. Since we have opened that up, we have scores of printers from these segments counted among our members, and the numbers are growing. And has this been by design? Not as much as you would think. The market is changing us, whether we like it or not. The Expo has seen steady increases in attendance from these other segments as they have been exploring wide-format equipment and now direct-to-garment equipment. It only makes sense that many would join for the benefits of discounts, publications, training and so forth. So, regardless of the originating community, we are essentially becoming an association for the larger printing community. So, what's up next for SGIA? Ha! Isn't that enough? We'll have to see. I expect there will be more developments, either strategies we pursue by design or ones thrust upon us through circumstance. It's an exciting time to be in this industry. 2019 should be a watershed year in many ways.